Ed Joyce and Kevin Pietersen hit half-centuries as England eased past Kenya, winning by seven wickets and qualifying for the Super 8 phase. 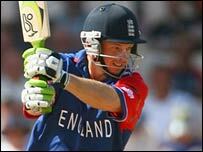 England had lost two early wickets after skipper Michael Vaughan and Ian Bell both fell to catches. Joyce and Pietersen put on 103 before Joyce was bowled by Steve Tikolo for 75, but Pietersen (56 not out) and Paul Collingwood saw England home. 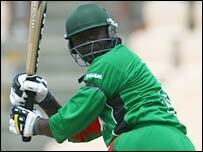 Earlier, captain Tikolo hit 76 in a rearguard action as Kenya made 177. After heavy rain had delayed the start by two hours, the match was reduced to 43 overs per side. England made two changes, with all-rounder Andrew Flintoff and seamer Sajid Mahmood recalled at the expense of spinner Jamie Dalrymple and paceman Liam Plunkett. James Anderson swung the new ball well, taking two early wickets as he bowled Ravi Shah for four before fellow opener Maurice Ouma lifted him to Paul Collingwood at mid-on. But Kenya skipper Tikolo soon hit two fours off the final over of Anderson's first spell, and looked comfortable against Ravi Bopara - who bowled just one over, conceding seven runs - and Collingwood. Tikolo and Tony Suji threatened a recovery but that promising stand of 38 was ended when Suji, preferred to David Obuya in the line-up, spooned a catch to Michael Vaughan in the covers off Mahmood. Tanmay Mishra was then clean bowled for a duck after playing an ugly-looking shot to Collingwood's medium pace. Spinner Monty Panesar was finally introduced for the 24th over - and in that over, a mix-up saw Collins Obuya run out. After Tikolo nudged Panesar to short third man, non-striker Obuya called for a run - but the skipper failed to leave his crease and sent back Obuya, who was easily run out for 10. Wickets continued to fall around Tikolo as Thomas Odoyo was trapped lbw by Flintoff, claiming his first wicket of the tournament, while Jimmy Kamande was lucky to survive a similar appeal in the same over. But Tikolo soon reached his 20th ODI fifty off 58 balls, adding 39 with Kamande until the latter was bowled for 17, becoming Collingwood's second victim. Tikolo also had a let-off on 52 when he was dropped by Joyce at mid-on off Flintoff's bowling - while Kenya's running between the wickets always made another run-out look likely. Flintoff finally had his revenge when he finally yorked Tikolo, while Vaughan then ran out Peter Ongondo following another mix-up. Lameck Onyango was run out by keeper Paul Nixon going for a run off the last ball of the innings. But after the brief interval - truncated by England's slow over-rate - opener Joyce nearly played on with an inside edge before Vaughan was well held at gully by Obuya off Ongondo in the fourth over for just one. Joyce and Ian Bell put on 40 for the second wicket until Bell (16) tried to attack Odoyo but gave substitute fielder Rajesh Bhudia a simple catch at mid-off. Pietersen then announced his arrival with a straight-drive for four from his first ball - while Joyce soon hoisted Onyango for six over midwicket. Keeper Ouma then missed an easy catch behind off Pietersen off left-arm spinner Hiren Varaiya's first ball, when the Hampshire man had just seven. Joyce reached his fifty from 59 balls, while at the other end Pietersen began to cut loose and eventually reached his half-century off 54 balls, having hoisted Varaiya for a huge six. The game was virtually decided by the time spin was introduced, and the third-wicket pair had looked set to take England all the way before Joyce fell to spinner Tikolo's doosra and was bowled for 75. Collingwood arrived to help see his country home, and added 18 not out for an all-round contribution to the match which also included two wickets and a catch. But it was Pietersen, who made 56 not out off 72 balls, that hit the winning run and send his side through to the second phase with group winners New Zealand. England will start the Super 8s against Ireland in Guyana on 30 March, although unlike New Zealand, they will not take any first-round points through following their defeat by the Black Cats in the opening game.